Rhubarb is a perennial, coming up year after year. Rhubarb provides a large crop from a small space, and is harvested from May to August. 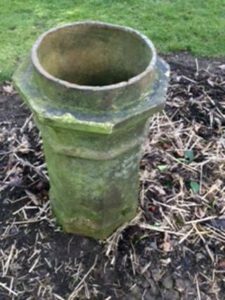 Rhubarb crowns are planted in the winter when they are dormant. 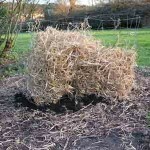 • Add two bucket fulls /sq.meter of compost or well rotted farmyard manure to the soil, and dig it well in. • Lay the crowns in the soil so that the tips of the crown are just showing above the soil. • Crowns should be 80cm apart with 30cm between the rows. The time to divide or move rhubarb is in the autumn or spring when it is not growing. 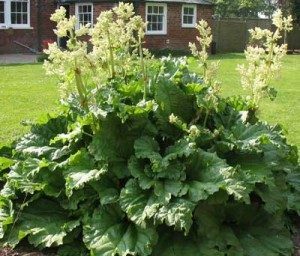 • therefore best to lift & divide a small section of the rhubarb bed each year, so there are always some older plants to force and use. * The rhubarb is ready to produce shoots in January. * Force it up, by creating a dark environment. * Cover it with a chimneypot, dustbin, or straw. Forced rhubarb has long, tender, light coloured shoots which are good for pies and crumbles. Rhubarb is really a spring crop. Rhubarb can be pulled all summer if it is growing vigorously, and if at least 25% of the stalks are left on the plant. When the stalks are no longer fat and juicy, but grow as thin stalks, the time has come to give it a rest. 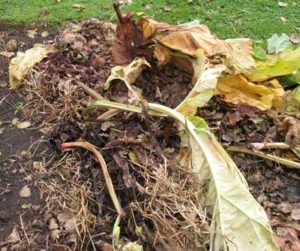 The rhubarb plant should be kept weed free, so that it can grow and feed its roots. All damaged and discoloured leaves should be removed with their stalks. 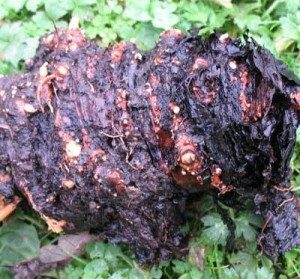 In the autumn, rhubarb appreciates a good covering of well rotted farmyard manure. Rhubarb is pulled from May to August. Wait for the leaves to fully open, and choose the largest stalks. Harvest the shoots when they are about 10inches long. Insert a finger between the stalk and the bud, and gently push to the base of the bud before simultaneously twisting and pulling. This ensures that the whole stalk is removed. If part is left it will rot and spoil subsequent growth. Rhubarb is really pulled, not picked! 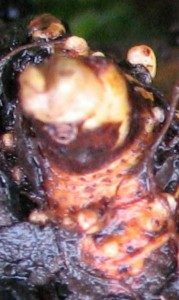 Rhubarb stalks must certainly not be cut with a knife as fungal diseases attack the plant through the cut. Remember not to pick every stalk, leave some rhubarb to feed the root for next year. Flowering rhubarb is a common site in the summer. If the rhubarb flower is left on the plant, the root will be weakened & the stalks will be weak and thin. Some people like to see rhubarb flowers in the garden. 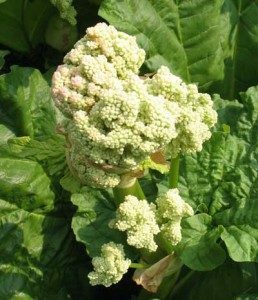 But if you are after rhubarb for the kitchen, the rhubarb flowers should be removed as soon as the flower buds are seen.